In August of last year, one of the city's most blighted properties was brought to the ground. The East Eighth Street building was featured in City Beat more than ten years prior as "Blight of the Week". In October 2011, it was spotted on eBay where it was offered for sale at a price of $5,500 and described as a six-unit apartment building. But the building, like so many that have fallen into disrepair, was once a beautiful home where happy family memories were created and celebrated. The River City News was contacted this week by a woman who grew up there and offered to share her family's story. Juliette Gorman Smookler said that her family lived in the building from 1941 to 1978. "Back in the day, when Covington began to flourish, people could spend a nice afternoon in Covington doing many different things," Smookler wrote. "You had the option of going shopping at Coppin’s Department Store and other retail stores, have lunch at the cafeteria there, maybe go to Lang's Restaurant across the street, or just grab a hot dog at Woolworth's or Kresge's. Further up the street on Madison Avenue you could go to Lily's Candy and Soda Shop and have a banana split. If it were early in the afternoon you could possible fit in a movie at the Madison or Liberty Theatres. It was a wholesome atmosphere with a lot of fun things to do." "During this time, East 8th Street was a well-kept neighborhood with well-manicured lawns and flower gardens. I felt it was a pity not to mention some good things that had happened that have affected our community and families that lived there during this time. Our family- The Gorman Family - have good memories of the area." 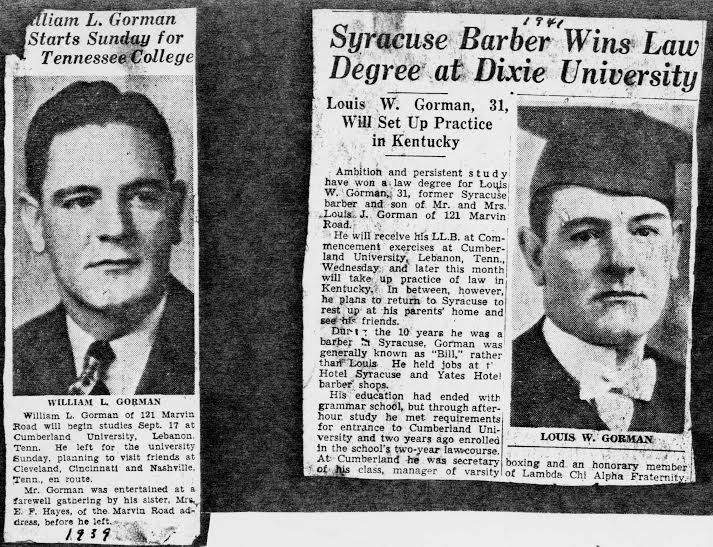 In 1939, a single 29-year old man from Syracuse, New York decided to forego his barber trade, which he had learned from an uncle, to embark upon a career in law at Cumberland University in Lebanon, Tennessee. Louis had practiced the barbering trade for 10 years at the Syracuse and Yates Hotels and eventually rose to owning his own, Louis' Beauty Shoppe on 519 South Salina Street in Syracuse, New York. This was not an easy task during this time period. Louis sold offhis barbering equipment and on Sept 17, 1939 made his way to Cumberland University to begin his studies in law. A long way from his home. Upon arriving at C.U. he soon became acquainted with colleagues who would later in their careers become prominent members of the law profession, and assume positions in their communities as circuit judge, police judge, federal court judge, and even attorney for Judy Garland, Frank Sinatra, Wayne Newton and many others in Las Vegas, Nevada (Hon. Harry Claiborne). While enrolled in his grueling law program, much to the surprise of his friends, Louis not only held down his school work, but began barbering on the side for extra money to pay for books and general living expenses. His fellow students were generally very happy for the convenience of a personal barber on hand. He also maintained a part time job at a local barber shop in Lebanon, Tennessee, which was close to school. In addition to this busy schedule, he also managed to become a member of Lambda Chi Alpha Fraternity, secretary of his law class, manager of the Varsity Boxing Team class of 1941. In later years was appointed Kenton County AAU Boxing Chairman. After graduating from C.U. in 1941, he married Valia Ann Martini of Jamesville, New York and settled in Covington at 108 East 8th Street. When his family began to grow, he borrowed money from his father to purchase this property as their home. At the same time, he began his new law practice in association with Israel Aron, attorney ­at ­law located at 32 E. 7th Street, Covington, Ky.
Later he practiced with Fred Read, attorney­ at­ law on 2nd Street in Covington, as well. In the 1950's, Louis became active in his community and became Kenton County Magistrate 1st District, Justice of the peace, served positions at Democrat club as President and Secretary. He ran for political office of Judge for Kenton circuit, 3rd Division, and for Judge 2nd Division. Louis was a member of the Knights of Columbus 3rd and 4th Degree (1942­-1977). When Louis branched out with a law practice of his own, he relocated to 329 Court Street, Covington, Ky., where he invited a new friend and associate, Gus Sheehan, Jr. to join him in practice. Other firms who became associated with them in the practice were Martin J. Hogan, attorney ­at­ law, and Sylvester Hoffman Realty. Gus Sheehan, Jr. moved ahead in his career to become State Senator in Kentucky for consecutive years, and owner and editor of the News Enterprise newspaper in Ludlow, Ky. He is known as a prolific man in Kentucky, in his own right. When Louis was Magistrate, back in the days of illegal gambling in Newport, and Covington, Ky., he defended clients of the Teddy Bear Lounge Club which had been raided by the police. He kept the club from suffering total confiscation of the premises. Soon after this, he was approached by a mobster offering gratuities if he would agree to become their permanent attorney. Louis respectfully declined stating, "I have a wife and children to protect. I could never jeopardize that; it's against my religion." As an attorney he had taken cases in Covington and Ohio for people who were poor and had nearly nothing to pay him in return for services. Louis was honest and outspoken and had a trait some would describe as verbally, "blowing the boat out of the water." On one occasion in court, after arguing a point for a time, he exclaimed to the jury and all: "Let the truth be known, the truth will set you free." He won the case and everyone laughed. There are numerous stories and jokes of his humor and shortcomings , his New York accent and mannerisms always very different from those in Northern Kentucky. As time progressed, Louis had moved his family to a home in Park Hills, Ky., and 108 E. 8th Street became rental property. Over the years many repairs were made to the building and upkeep was always a priority. In time, many of the residents living there often skipped out on the rent, leaving our family to clean up and make repairs. Louis owned other properties, such as the Big Bar, now Pachinko's, on Bakewell St. and a building on 613 Main Street, called Main Street Furniture store. All were readily repaired as needed. All eight of us children remember being made to clean and paint on 8th Street and other locations, to earn extra money, or allowances, when we were in grade school and high school (St. Agnes, Covington Catholic, Notre Dame Academy). The properties were all kept in good shape. In 1976 amidst moral issues of which Louis was opposed, he changed political parties and became a Republican. In his last political feat and attempted election for Commonwealth Attorney, he felt that after practicing law for 36 years he would benefit from this change and for health reasons. At this time his law office was now relocated to 108 E. 8th street, foregoing the property as rental space. In this last election, he felt that he was defeated to a party that was not "for the people," for whom he and his law partner had always been an advocate. On November 19, 1977, he suffered a stroke following the election in which he ran for Commonwealth Attorney. After his death, the property at 108 E. 8th Street was sold. When our family learned that the property had not been cared for and needed to be razed, we were all very emotional. This property, at one time, had enabled our family to thrive. Income from it had helped to pay for tuition for high school, and for some of us, Nursing school and Medical school. No one will realize the legacy that started in that "old blighted property" that was razed at 108 E. 8th Street in Covington, Ky. in August 2013. We had been born and raised there, and had worked there, we had given it our best. All in all it did give back to us in helping finance the education of eight children. God Bless 8th Street.